Available in some of our bestselling cover designs, these pencil cases make ideal stationery sets when paired with the matching journal, address book or planner. Within every pencil case is a smaller, removable box that can be used to store everything from paper clips and fountain pen nibs to earrings and other baubles. 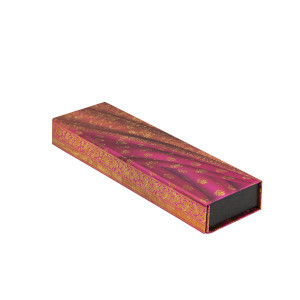 No ordinary pencil cases, these eye-catching rectangular boxes are designed to hold favourite pens and pencils or even your finest jewellery. The lid flap folds around to create an open presentation case, displaying the treasures within. The wrap-around lid connects to hidden magnets embedded in the case, keeping your belongings secure even during travel. The well-crafted paper design is highly sturdy and always holds its shape. We are proud to give credit to the talented individuals and artistic movements that have inspired our journal designs. 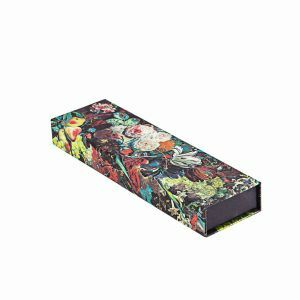 Every pencil case comes with a Paperblanks bookmark containing credit and copyright information, as well as a fascinating historical background for the original artwork.